According to Slashfilm, the 2016 film is set shortly before A New Hope and is a heist film of sorts. What is being heisted, you ask? Why the plans to the first Death Star, of course. And the story focuses on bounty hunters and is described as a kind of Seven Samurai, Ocean’s Eleven, or The Dirty Dozen, but set in a galaxy far, far away. If true, this takes a familiar piece of Star Wars and turns it on its head, so it both hooks you on what you know and gives you something you don’t expect. The opening crawl of A New Hope says that “Rebel spies” stole the plans for the Death Star, it doesn’t say actual Rebels. It’s easy to make that assumption, but while they’re well funded and have powerful backers, the Rebel Alliance doesn’t necessarily have the most extensive military in the galaxy (how else does a former smuggler like Han Solo rise to the rank of general so fast?). It’s entirely possible that they paid someone with the necessary skills and lack of scruples to steal the designs for them. It’s a cool idea that provides a different perspective on the Star Wars galaxy. We’re so used to following the good guys, the heroes, that hanging out with some dubious characters could bring in some welcome shades of grey. Destroying the Death Star is a huge moment in the saga, and this would give us a broader picture of how that happened, as well as bring in some of the surrounding elements. Given the timeline, it’s possible this could intersect with the action in Star Wars Rebels, and there’s definitely room for the likes of Darth Vader and the Emperor to show up. 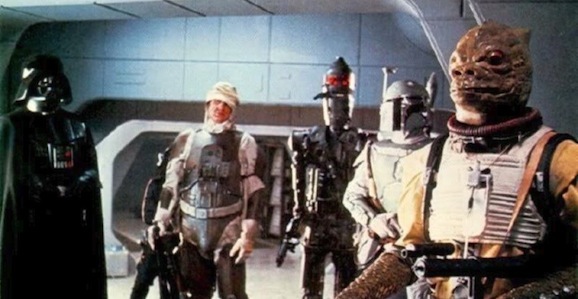 There have been reports from the word go that the first spinoff includes Boba Fett, and while he’s not specifically mentioned here, if bounty hunters are involved, it’s certainly possible that he may be around. Another part of this report states that the main character from this film will be introduced in The Force Awakens. He would obviously be much, much older in that film, and they speculate that this could be Max Von Sydow’s character. He’s certainly the right age, and there have been rumors that he is a retired bounty hunter named Montross, which fits in with this new rumor. However this works out, I’m pretty into this idea. It sounds like a lot of fun and has the potential to be full of all of the kind of swashbuckling high action and adventure that makes Star Wars so awesome. What do you think, do you want Gareth Edwards and Gary Whitta to deliver a movie about a group of bounty hunters lifting the plans for the first Death Star? Lets us know in the comments below. The Bounty hunters, yes. But I don’t think the EU ever touched the first Death Star plans using the same gang of bounty hunters in ESB? Montross/Sydow also is rumored to be leader of a pirate gang in Force Awakens. He has his own cronies. A young Montross with these guys acquiring the Death Star plans sounds plausible. We may not even see Boba Fett’s friends. But they were con artists not bounty hunters. Again, this has been rendered moot, with the upheaval. The new Tarkin novel briefly touched on the original DS though.